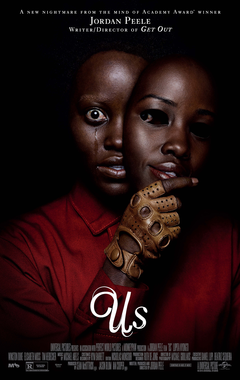 With enough mirrors, doublings, and doppelgangers to make Hitchcock, Kubrick and Welles proud, Jordan Peele’s “Us” cements the filmmaker’s reputation as a master craftsman and visual stylist. Creepy, funny, and wicked sharp, the film’s genre is horror, the ideas are expansive and the execution clean. An ominous text prologue alludes to the networks of unused and abandoned tunnels snaking underneath the streets and communities of the United States (shortly, a glimpse of the VHS spine of “C.H.U.D.” next to a television sweetens the allusion). Next comes another prologue introducing viewers to Addie, a child traumatized during a solo visit to an amusement park funhouse on the beach of Santa Cruz, California in the mid-1980s. We reconnect to the grown-up Addie (Lupita Nyong’o) more than thirty years later as a married mother of two, trepidatious and secretive about an upcoming return to the location of her childhood nightmare. Along with husband Gabe (a terrific Winston Duke), daughter Zora (Shahadi Wright Joseph), and son Jason (Evan Alex), Addie sets out for the family vacation home and eventually gives in to Gabe’s desire to meet up with friends Kitty (Elisabeth Moss) and Josh (Tim Heidecker). Peele’s world-constructing unfolds at a deliberate pace, but the director laces this entire build-up with a wealth of important detail that pays dividends in the wild second half. Peele’s inclination to invert the 1986 Hands Across America fundraising effort as a means of critiquing the dark forces of wall-building, racism and selfishness works. Really works. “Us” interrogates the deep divides within and among the population, literalizing the other as the very worst parts of ourselves. In that way, the movie’s timing is perfect, but it also thinks carefully about economic and class divisions by situating the action among families of wealth and privilege. The links between the America of Ronald Reagan and America under Donald Trump don’t intrude on the value of “Us” as entertainment, even though Peele’s thematic interests look poised to inspire a healthy supply of essays. “Us” also owes a considerable debt to “Invasion of the Body Snatchers,” and both Don Siegel’s brilliant 1956 classic and the 1978 Philip Kaufman edition inform a great deal of the social commentary explored by Peele. 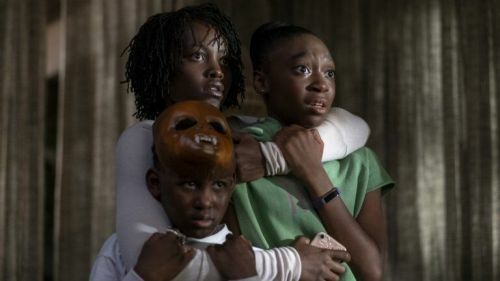 The structure of “Us” follows conventional horror tropes, and some viewers may have less patience with the long-simmering arrival of the home invasion component teased in the trailer. Others, however, will delight in Peele’s affinity for tension-breaking comic touches, several of which stand out as highlights -- especially those that grapple with the suspension-of-disbelief requirements governing the specific rules of the “Us” universe. All the principal actors are called into service for a pair of distinct performances; each plays the twisted and malevolent simulacrum as well as the above-ground “normal” person under attack. Nyong’o, who drew fire from organizations including RespectAbility for partly basing her character Red’s voice on the sounds of sufferers of spasmodic dysphonia, anchors the movie as Addie and Red. Ultimately, the brilliance of “Us” is found in the complex duality offered by Peele’s fascinatingly sympathetic reading of the duplicates called the Tethered. “Us” will make your head spin as you attempt to tell the difference between the heroes and the villains.